This past weekend I visited Boston’s Institute of Contemporary Art to view the exhibition: THIS WILL HAVE BEEN: Art, Love & Politics in the 1980’s. I had been looking forward to seeing it, because I lived in New York City’s East Village back then, even worked in a gallery in Soho for a while, and the 80’s downtown art scene was edgy and exciting. It was a time when I’d pass artist Keith Haring in the street, or spot him in a club surrounded by young Latino boys. It was the period of art as commodity, and the artist as rock star, with our luminaries: Richard Longo, Julian Schnabel, Jean-Michel Basquiat, Kenny Scharf and Jeff Koons. It was a time for women artists and feminist art with Cindy Sherman, Barbara Kruger, Jenny Holzer, and the Guerrilla Girls. It was a heart-breaking time in the arts community with HIV and AIDS in full-force, and we had artists who explored the political and the personal, like David Wojnarowicz, and photographer, Robert Mapplethorpe. There were many works of art at the exhibition that were familiar to me. One that stood out, and also reflected the late 80’s time period, was a work I remember seeing at a downtown gallery when it was first made–rows and rows of empty crack vials and their plastic caps, framed as if they were a carefully curated specimen collection. Each candy-colored cap and vial had in tiny pencil writing, the location, and the date when they were found. Most of them were discovered on East 3rd and 4th Street near the Bowery, the walking path I took on the way to and from the homeless services agency I then worked for. I remember walking over sidewalks littered with these same empty vials and caps, and thought of collecting them to make some kind of statement necklace. I remember passing by groups of men huddled outside of the Men’s Shelter on the corner of 3rd and the Bowery, and the deep sadness I felt when I’d spot one, paranoid and delusional off of crack, looking furiously on the ground for a crumb of the white rock so he could have just one more hit. Adrian Piper, an artist (and philosophy professor), was born in New York City in 1948 and has a BFA in Visual Arts, and a PhD in Philosophy. She is considered a conceptual artist whose work is more about ideas than visual form. I remember Piper’s Calling Card, and delighted to see them displayed at the ICA’s exhibition. I loved that there was a stack of them in business card holders to pick up by museum visitors for their own use. 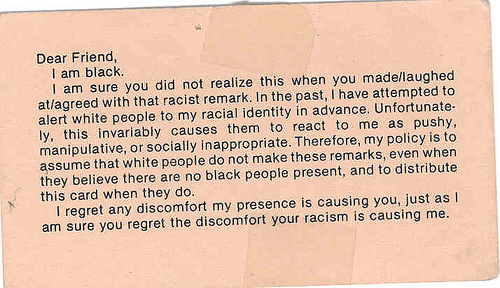 Piper, a light-skinned artist of mixed heritage, born to a white father and black mother, used to pass these cards out to strangers who made derogatory remarks against black people in her presence. I will say no more. Below is the card. If you’d like your own version of the card, you can Google (under images) Adrian Piper’s Calling Card or Race Card and get your very own. And, if you are in the area and don’t want to miss a memorable art exhibition of important works from the 1980’s, visit the ICA soon. The building, with its glass front facade, has a daring look out over the Boston waterfront, and is a treasure in itself. THIS WILL HAVE BEEN: Art, Love & Politics in the 1980’s will be on view until March 3, 2013.